Just check the advice from the US National Weather Service. It has warned that the current low temperatures could easily “freeze the flesh off your bones”. Don’t leave home if you can avoid it, the NWS in Iowa urged, and if you do have to go out, “avoid taking deep breaths; minimise talking”. 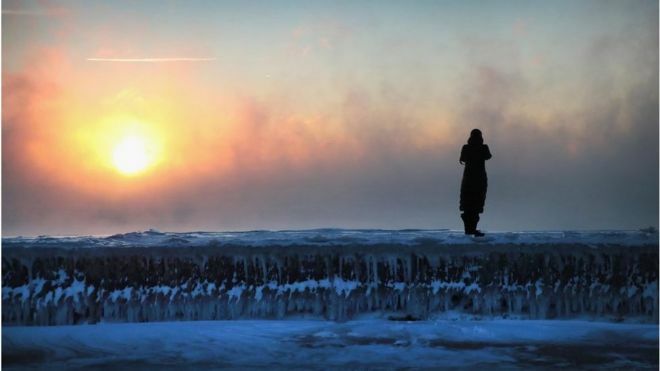 My favourites include the icy steam pouring off lake Lake Michigan and the thousands of people who have been doing the “hot water challenge”.But this wonderfully surreal image of a fork frozen in a cascade of noodles wins for me. Sadly, the answer is no, as one of the president’s own agencies quickly pointed out in an apparent response to his tweet. “Winter storms don’t prove that global warming isn’t happening” tweeted the National Oceanic and Atmospheric Administration. You have probably already heard that the current brutal weather is thanks to something called the “polar vortex”.